In the early middle ages Wales was divided in several kingdoms, each with its own laws. Hywel ap Caell, usually known as 'Hywel Dda' or Hywel the Good, who became king over nearly all of Wales in 942, is credited with having brought these different systems into a single body of law, although three different versions exist: for Venedotia (north Wales), Dimetia (south Wales), and Gwent (south-east). The Law continued in use in Wales until the union with England in 1536. 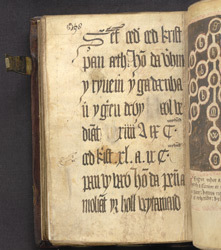 Expanded and re-edited over the following centuries, the laws of Hywel ap Caell became the standard of social relations throughout Wales, although some local variant customs continued to exist. The courts that used law books like this one travelled a circuit rather than being sited in one permanent place. The beautiful large script of this page shows the status held by the book as a supreme intellectual achievement of the kingdom.